Edwin Mattison McMillan was born on September 17, 1907 in Redondo Beach, California. His father Edwin McMillan was a physician. As a child McMillan was always building gadgets and living in Pasadena, California he was able to attend lectures and get to know the physicists at the nearby California Institute of Technology. After high school he attended the California Institute of Technology studying physics and chemistry and earning his B.Sc. in 1928 and his M.Sc. one year later. He earned his Ph.D. at Princeton University in 1932. His thesis described the behavior of a beam of hydrogen chloride molecules in a non-homogeneous electric field. After earning his Ph.D., McMillan won a National Research Council fellowship. At the invitation of Ernest Lawrence he went to the University of California at Berkley where he worked in Lawrence's Berkley Radiation Laboratory. He became a an instructor in the physics department at Berkeley in 1935, assistant professor in 1936, associate professor in 1941, and professor in 1946. During the World War II MacMillan worked at the Massachusetts Institute of Technology developing radar, at the U.S. Navy Radar and Sonar Laboratory in San Diego California working on sonar, and he worked on the Manhattan Project in Los Alamos, New Mexico. He returned to Berkley after the war and with the death of Lawrence in 1958 he became director of the Berkley Radiation Laboratory, later renamed after Lawrence. He remained director until his retirement in 1973. 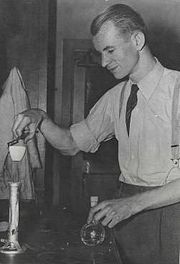 McMillan is most remembered for his work in creating the first transuranic elements. Working at Berkley he used the newly invented cyclotron to bombard uranium with neutrons and deuterium to create neptunium and plutonium. These elements (atomic numbers 93 and 94) were the first elements created with more protons than uranium, which was thought to have the highest possible number. Like uranium these elements are subject to radioactive decay. McMillan and Glenn Seaborg, who finished MacMillan's work when he left Berkley to go to M.I.T., were awarded the Nobel Prize in Chemistry in 1951 for "their discoveries in the chemistry of transuranium elements". McMillan also used the cyclotron to create other non-naturally occurring radioactive elements including oxygen-18 and beryllium-10. Other honors won by MacMillan include election to the National Academy of Science in 1947 (he served as its chairman from 1968 to 1971), the Atoms for Peace award in 1963, shared with Vladimir Veksler, for the creation of the synchrotron, and the National Medal of Science in 1990. McMillan died on September 7, 1991.